Metal sculptures take many forms. Throughout history various materials have been used to create metal art sculptures: bronze, copper, silver, gold and steel, just to name a few. In recent years, many metal sculptors have opted to use alloys such as aluminum to create their figures and monuments because the material is lightweight, attractive, durable, resistant to rust/corrosion/patina, etc. High-quality aluminum can be used for outdoor metal sculptures in direct sunlight or just about any weather conditions, and it will maintain its' appearance and integrity. Although Nicholas does love the inherent properties, appearance and pliability of aluminum for his metallic sculptures, he is fond of stainless steel as well and can create any of his designs in steel rather than aluminum if you have a particular reason to prefer one metal over the other. You can find metal sculptures for sale from a variety of artists, however none have the unique experience and expertise that Nicholas Yust has. With a background in both artistic design and metallurgical engineering, Nicholas has both higher education and real-world experience in art and heavy-duty metal engineering. These two skills and passions combine to make him undoubtedly one of the most talented, recognized and respected metal artists in the world. Please note: Any of the sculptures below can be customized by size and can also be painted in any color combination, so please contact us for a custom price quote. A shorter, broader metal sculpture that is made of ground and twisted aluminum on tumbled marble, with arms reaching, grabbing, overlapping and intertwining like so many tentacles of a sea creature. This silver abstract is an ever-intriguing addition for contemporary spaces. Pure metal floor sculpture with artistic grind patterns. Wavy body shape and mounted on a square base. Hand-crafted by Nicholas Yust, created with high quality materials. It has artistic grind patterns on the body and on the oval base. Silver contemporary pure metal floor sculpture. It has a very simple surface with a unique shape that give this art piece a spectacular appeal. A pure metal silver floor sculpture with different grind patterns from circles to lines to waves. The base is patterned to our Boundaries wall piece. This can be seen as a Father and a Son. This unique art piece with artistic grind patterns can provide a masculine feel in any room. Father, Mother, and Child-- this piece is a very unique representation of a family. Silver pure meron floor sculpture with wavy grind patterns. Plain silver pure metal floor sculpture. Created by hand with utmost care by Nicholas Yust, this unique piece is a good addition to your home accents. A tall silver artwork hand-crafted by Nicholas Yust. This sculpture is mounted on a circular base and designed with multiple patterns. A unique floor sculpture in silver. It features wavy grind patterns on the body and circular patterns on the base. This artwork is a pure metal floor sculpture by Nicholas Yust. It has multiple standing silver pieces with artistic grind patterns and mounted on a rectangular base. Silver ultra-modern pure metal piece by Nicholas Yust. It has artistic grind pattern on one side and a plain untouched surface on the other. A very simple pure metal floor sculpture in silver. It has long body curved at the top, hand ground patterns and an oval metal base with a different pattern. Tall metal piece hand-crafted by Nicholas Yust. It has swirl design and artistic wavy striped grind pattern and a round base. Silver contemporary floor sculpture created by Nicholas Yust. It has wavy grind patterns all over its tall body. A lasso-like metal floor sculpture hand-crafted by Nicholas Yust. This pure aluminum piece has wavy grind patterns. Sleek and simple silver metal floor sculpture. It is created by the artistic and talented hands of Nicholas Yust. This pure metal piece by Nicholas Yust has unique grind patterns. It is comparable to the trail or marks left by a snake. This floor sculpture is artistically cut, ground and bent from sheet metal. 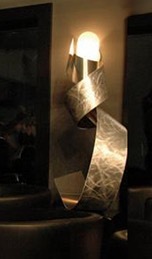 A weightless, flowing design stretching from a mounted metal base up towards the sky, Gaffico appears to be captured as though it were a photograph of a rippling ribbon in the wind. The 'Embracing Beings' is one of Nicholas' most beloved abstract metal sculptures. As the name suggests, the two primary metal structures depict the concept of a pair of individuals wrapped up together. This sculpture is mounted on a sturdy base and ready for indoor or outdoor placement. The base of your metal sculpture can be customized upon request. By default they will have either a stone or a metal base, which may or may not be the exact base you see in the original product photography. Nicholas Yust's standard base sizes are 8"x8" for sculptures up to 36" tall, and 12"x12" for sculptures larger than 36" tall. Artistic Process: How Does He Make it? Some metalworkers will use molds or casts to create their sculptures, while others might hammer their designs. Some artists use wrought iron for a more traditional-style art (or even garden/yard art,) while others use sheet metal for more decorative sculpting. Welding, hammering, bending, drilling and bolting are common practice among just about all metal sculpture techniques. Nicholas Yust, as a more modern/abstract/contemporary style artist uses sheet metal to create his metallic sculptures. He applies decorative grind patterns and (for colored designs) semi-transparent paints to turn ordinary metal into extraordinary sculptures. He will then cut, trim, bend and weld the metal strips to the desired artistic shape/design, and then mount them to a carefully-selected, sturdy base to complete the work. All of our metal sculptures for sale here will ship direct from Nicholas Yust's personal studio in Cincinnati, and will be entirely hand-crafted by the artist himself. We are the exclusive online representatives of the metallic sculptor Nicholas Yust, so you may direct all purchasing, tracking, customization, and information requests or questions through our Contact Page. All of the metal sculpture art created by the artist uses only the highest quality materials and the most skilled and efficient processes, resulting in unparalleled metal sculptures also worthy of the 'green art' label.